Finding teachable moments to talk with children about death may seem daunting to some people, while others have no trouble. Depending on the situation, the opportunity may happen suddenly and it takes presence of mind to catch the moment or prior planning can go into creating teachable moments. One story I read spoke of finding an outside bird that had died and taking it home to bury it with the help of the younger children. Doing this may seem strange to some, but consider for a moment the potential positives. There are no attachment bonds for the children to the bird. The children learn about and see what it looks like when something once alive is now dead. Family pets and death may be more difficult when used as teachable moments due to fact there may be love for the pet and the child’s heart is sad, grieving the death loss. Sometimes, children are sad when a bug dies. Use whatever opportunity presents its self to talk about death before a more serious death occurs with a person the child is close to. Taking a walk through a cemetery and looking at the birth and death dates inscribed on a headstone often spark conversations with younger people; especially the very old ones where death occurred a hundred or so years ago. Look at different aspects of nature that have a focus on endings such as leaves that fall from a tree, flowers dying or a snowman melting. 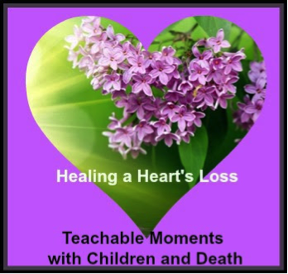 Teachable moments start to prepare a child for a death loss and provide a future frame of reference to pull from when needed. Using the correct language when talking about death and perhaps doing a burial ritual with sensitivity and care will help the child understand the process in which some deaths go through. Consider getting books from the library or other sources that talk about death and dying. Books can found that relate to many aspects and topics about death that are suitable for children and youth. Teachable moments are just that, teachable and are no substitute for a serious death loss. Let the child know it is okay to cry and be sad. Lead by example. If you as an adult feel sad for the death then say so. Change the future experience of death by starting with a teachable moment. More often than not, I am seeing and hearing of people who are not hiding death from children as a means of protection. They are explaining the reality of life and death in many ways. Which person are you?